Exhibit | The Influence of Anxiety: Lovecraft, Bloch, Barlow, et al. Brown University Library presents The Influence of Anxiety: Lovecraft, Bloch, Barlow, et al., an exhibition focused on H. P. Lovecraft’s literary network. 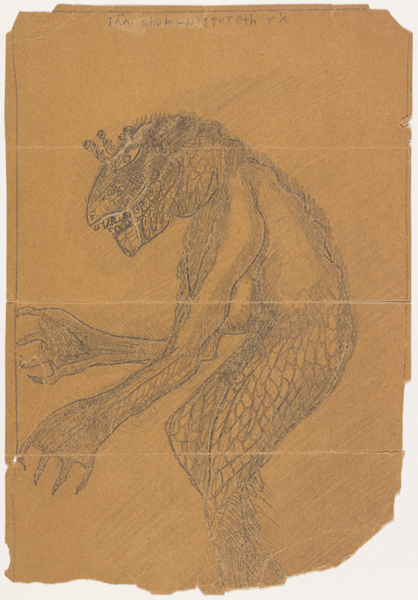 Showcasing the work of Robert Bloch and Robert H. Barlow, two of Lovecraft’s youngest correspondents, the exhibition illuminates the shared affinities and fears of those in his circle. Their correspondence is both visual and literary, descriptive and didactic, light-hearted and severe. Indirectly engaging cultural anxieties centered on the economy and rising tide of war during the 1930s, these writers pushed the horror genre in new directions. Their work at the edges of popular fiction continues to resonate with a broad audience and contemporary writers. There is also a complementary online exhibit, which can be viewed here. The H. P. Lovecraft Collection at the John Hay Library includes extensive holdings of manuscripts, letters, editions of Lovecraft’s works in 20 languages, periodicals, biographical and critical works, and numerous collections of manuscript and printed materials of Lovecraft friends and associates. The exhibition includes autograph manuscripts and selected letters, drawings and illustrations, and printed ephemera. Admission is free and open to the public. For additional information and standard operating hours consult the Library website: http://library.brown.edu/hay/. This entry was posted in Uncategorized by Jennifer Braga. Bookmark the permalink.